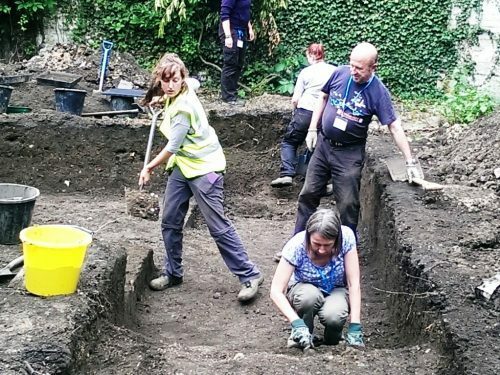 The Peterborough Cathedral excavation was a lottery funded community archaeology event organised in 2016 as part of the cathedral’s upcoming 900th anniversary celebrations. Many FRAG members participated in the dig as volunteers. 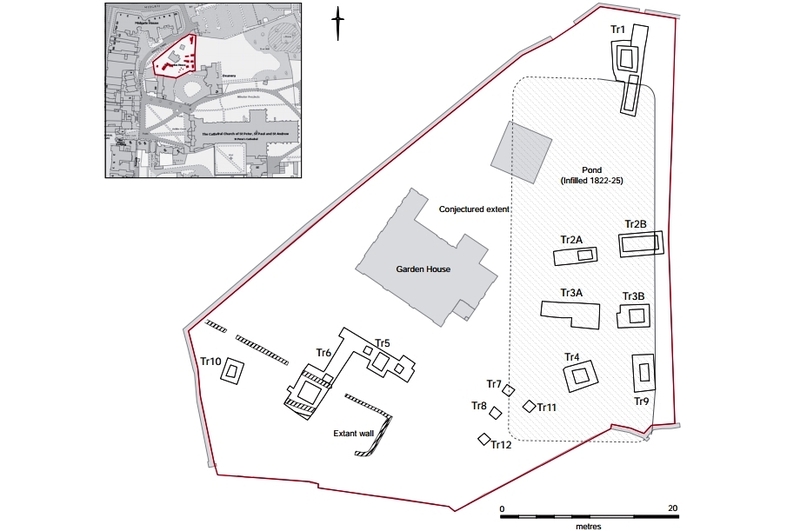 The report by the Cambridge Archaeological Unit who led the excavation has now been published. There was also a talk about the dig by Alison Dickens of CAU for the FRAG meeting in January earlier this year. The quantity of finds exceeded expectations and came from Roman times right through to the 20th century. The 10th century burgh wall remains somewhat elusive but there are clues as to where it may have been. One of the highlights was the discovery of a civil war campsite where bottles, pipes, musket balls and broken glass appear to have been left by Cromwellian soldiers. 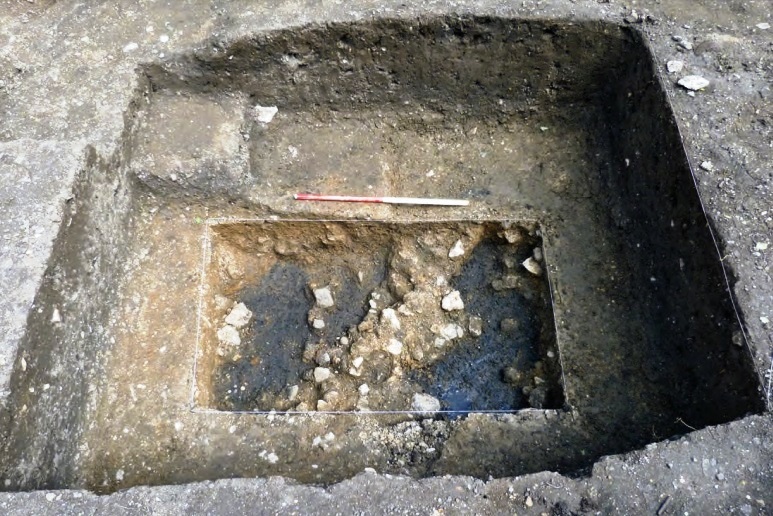 The excavation took place close to the Garden House which had been constructed within the north west part of the Dean’s garden in the 20th century (and is now earmarked for demolition). The trenches were sited to target potential archaeological features identified by an earlier geophysical survey, as well as to provide general coverage of the site. Top soil had been removed by mechanical excavator prior to the community element of the dig. The site is within the modern boundary of the cathedral grounds but it is believed the western section of the earlier Burgh wall constructed during the time of Abbot Cenwulf (992-1006) ran closer to the west front of the cathedral – potentially within the excavation area. 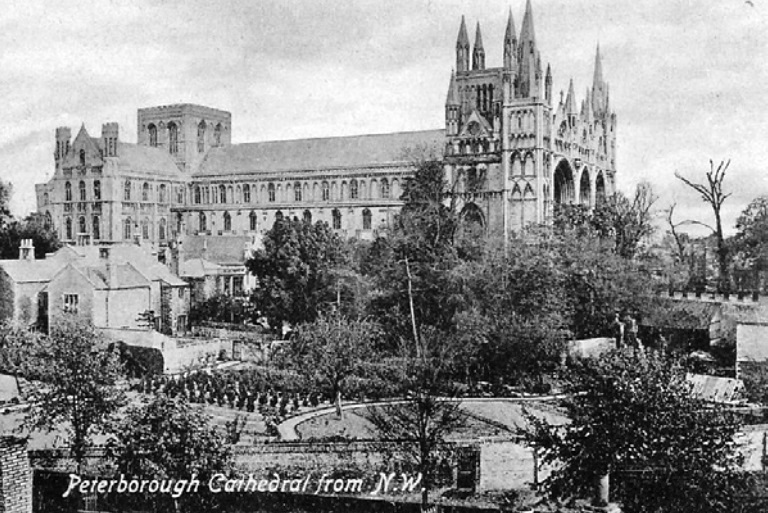 The site lies between the earlier centre of Peterborough (Medehamstede) which was to the north east of the cathedral and the current centre which was established in the 12th century. During much of the cathedral’s history the Tom Lock stream ran to the west of the site, and a large fish pond had been created in the area of the excavation. The pond was filled in and the area landscaped during the 1820s. A total of 14,351 items were recovered during the course of the project. Varying from Late Prehistoric to 20th century in date, the artefacts represent a broad range of types that reflect the differing activities that have taken place within this portion of the cathedral precincts, and surrounding area. The relatively substantial amount of Roman material, albeit largely from residual contexts, prompts the suggestion that a Roman settlement is present at the site. This is not a novel suggestion since there have been various scattered finds previously, and during the 19th century more significant indications during cathedral refurbishment work. The latter include fragments of Roman bricks, monumental inscriptions (possibly from a temple). One of the original objectives for the excavation was to locate the western side of the Burgh Wall – a stone structure built in about 1000. It is believed that the boundary of the cathedral estate was moved westward in the 12th or 13th century at the time of the construction of the enlarged abbey with its huge west front. The current excavation did not locate the wall, though there was rubble deep in Trench 1 which might have originated from the wall. The wet, stinky, black soil experienced by the volunteer excavators in this waterlogged layer echoed the descriptions of Don Mackreth who believed he had found the wall nearby in 1982. 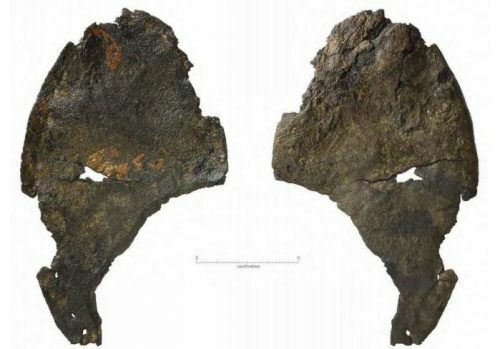 We now have much better reconciliation of the landscape with historical records and early maps such that a future excavation would have much higher probability of locating evidence of the wall. There is documented reference to the “pond yard belonging to the deanery” from 1563 but it is highly likely that the pond(s) in this area were present in Medieval times both for fish and as part of the abbey’s water management system. Nine of the trenches were within the pond area. A significant volume of finds came from the large volume of material used to fill the pond in the early 19th century. In Trenches 5 and 6 a series of refuse deposits had been introduced during the second half of the 17th century. The earliest material was dominated by drinking vessels, bottles (including stoneware flagons and onion bottles), clay tobacco pipes, and numerous fragments of window glass. There was also a lead musket ball in Trench 5. One is left with the vivid picture of revolutionary fighters on the rampage – smoking, eating and, above all, drinking to excess! By the start of the 19th century this area had already been reclaimed from its wet and boggy origins. The final step to enhance the area as part of the Deanery Garden was the infilling of the large pond in the 1820s. We have records of the garden design and the excavation unearthed many features such as garden paths and the remains of conservatory buildings. The material recovered from infilling the 2 metre deep pond is likely to have comprised refuse generated by numerous different residents of the cathedral precinct. Late 18th and early 19th century finds from this phase include a lot of ceramic and glass vessels. 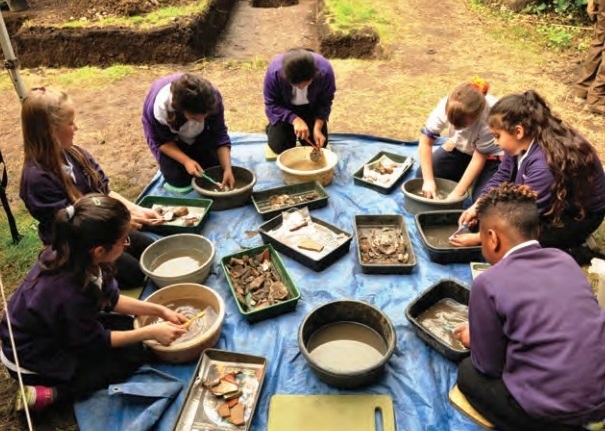 As well shedding new light on a number of phases of the history of the cathedral site this excavation was very successful in involving amateur archaeologists, school children and the general public. No Replies to "Peterborough Cathedral Excavation"